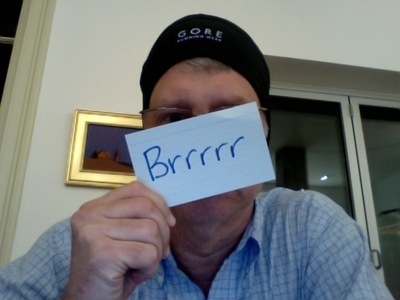 He's Not Blogging about the Weather, Is He? Yeah, I'm now that guy. Sorry. Ah, the beauty of sense/memory. During this morning's slog lively, energetic jog through the arctic tundra that used to be known as Central London, I was transported back to early spring days in Chicago, when I'd stand on an El platform, the wind cutting through however many layers I was wrapped up in (enough to make me look like the Michelin Man) and think, "it should never be this cold." So yeah, I guess a winter cold snap in London is the equivalent of spring breeze in the Windy City. Once I got to work, I saw headlines that there hasn't been such a chill in the London air since Princes Di ran into Camilla at Harrods' 1997 January Sale. So I wasn't just being a wimp. It is cold out there (for England at least ... notsomuch for Chicago). On the way home, I stopped by my friends at Runners Need and picked up a pair of glove liners (turns out layers aren't just for the torso), as the wind-proof ones I already weren't quite cutting it. I also got a new hat to my ears warm. Isn't it ironic that it bears the name of he who says the globe is getting warmer?